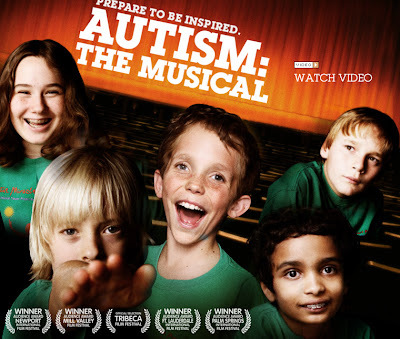 I recently watched an HBO documentary film called Autism: The Musical. It will be running several more times this month on HBO if you can catch it or record it. It is definitely worth the time. Autism: The Musical is a call to arms, bringing attention to a modern-day epidemic while celebrating the value of the human spirit in overcoming any challenge. The film introduces Neal, Lexi, Henry, Adam and Wyatt - five autistic kids who, along with their parents, take part in a groundbreaking theatrical workshop. The Miracle Project was started by Neal's mother Elaine Hall with an eye towards helping children with autism express themselves while learning to socialize with other kids. Over the course of six months, we experience the frustrations, challenges and triumphs of the families both on stage and in their home lives as they prepare for the show. The creative process provides a key to unlocking the children's inner worlds. We also see how patience, understanding,love and community can be used to help children with autism better adapt to the world at large. I have seen this documentary twice already, and saved it on my DVR because I know that I will want to watch it again another time. The first time I watched it alone, the second time I watched it with Tom. We were both moved by the children’s stories, and the director’s decision to not focus on medical terminology, or to have any medical experts on the subject giving us a play by play of the many one-of-a-kind quirks the children are displaying throughout the film. It made for a very candid, raw and touching film to watch. Tom and I agreed that we saw so many similarities in each of these featured children that mirrored our own experiences with our son. It once again spoke volumes to us about how individual this disorder is for each person. For example, we related Carter to Henry who is a child with Asperger Syndrome and has a photographic memory for things that interest him. Henry had a love of dinosaurs and reptiles at the time and Tom and I chuckled as we recall when Carter gets on a subject and obsesses about it. It has been anything from the 50 United States, their capitol and motto, to the US Presidents or his favorite dinosaur, the Parasaurolophus. We related how Henry would retreat into pretending to be a dino and go into his own world when he was anxious. We related our son to Adam, and his love for music and being able to get lost in it. We related to a scene where Adam was featured at the dinner table and refused to eat or try something new, and the immaturity that came along with the reaction. We related to the peer interaction at school when Adam gravitated toward the girls of the group that would play with him. We also related to the meltdown that took place at the musical rehearsal as Adam needed to be carried back stage and was acting more like a 2 year old than elementary school age child with his shouts of “let me go!” and being out of control without a lot of provocation. We related to Neal in situations that showed him self-stimming to calm himself by running in circles or attempting to retreat somewhere alone. One scene showed Neal getting physical with a boy at a party when he was overwhelmed by the stimulus. We related to how quickly our son has reacted in the past in similar situations and that sometimes it is still a challenge to deal with his impulsivity control in certain situations that get too overwhelming for him. Our relation to Lexi, took us back a few years ago, to a time when Carter was doing echolalic speech all the time. We remember what a trying time that was for us to wrap ourselves around how to handle it. He doesn’t do it very often now, but sometimes we catch him repeating and we need to prompt him to be aware of it. Lexi and Carter are very similar in the sense that they both can mimic someone else’s speech to the exact tones and inflections of their voices, like when she imitated Coach E’s greeting. And then there was Wyatt. I think Wyatt was the closest to how Carter is at this age (7) now. Wyatt had lots of questions and was very sensitive to things around him, yet sometimes didn’t know how to express his feelings. It seems that Wyatt is becoming very aware of himself and others around him and the way he is being treated. Bullying becomes a subject with Wyatt in this film and how it makes him feel. This hits close to home with us as our son is getting older and more aware of people not being kind. The film was all so genuine, unscripted and fascinating. It really emphasized the vast differences the way that this disorder can present itself in each person, as well as how each family has found a way to cope. We found it so cleverly done, that although it’s titled “The Musical”, it was less about the show they were putting on, and more about getting to know each child and their family dynamic, and what makes them special and unique. It was not a film that has one sitting through a bunch of facts about Autism, or one that has you writhing with pain that you feel for these families. It is a film about hope, and possibilities, and about demystifying the world of Autism. If you can, please take the time to watch this documentary. It will open your heart, enhance your own views and what we teach our kids about acceptance of others, and will make you look at your own life in a new way. It proves that anything is possible, and that being different is really OK.
Why don't you try and get this published on one of the autism sites? Oh man, I would love to see this. I'll have to find someone I know who has HBO. Andrea, I agree with John - this is beautifully written and so thoughtful. I think if it were published on another site, people would love to send it to their friends, to encourage them to watch the film and just generally to "be aware." Bravo.